Flowers that excel at attracting pollinators…tomatoes that have earned “blue ribbon” status…vegetables that stand out on the salad plate…plants that flourish in containers or small spaces. What piques your interest, or that of your friends and family? Just in time for the holidays, Seed Savers Exchange has created 10 themed seed collections, each ready for shipping, growing, and giving. Our new collections take the guesswork—and the legwork—out of choosing that perfect gift for veteran (or aspiring!) gardeners and seed savers. Each collection comprises from six to eight seed varieties that complement one another in the soil as well as on the plate or in the vase. Affordably priced between $17 and $24 each, they are the perfect gift for that someone special, even if that someone special is you. Shop here. Cut Flower: ‘Blue Boy Bachelor’s Buttons’…‘Love in a Mist’…‘Sensation Cosmos’—the whimsical names of the eight varieties in this collection are just the start of its appeal. Boasting colorful blooms in an array of shapes and sizes, this inspirational collection of long-lasting flowers beautifies the garden as well as virtually any indoor space. Pollinator: Get ready for the buzzing of bees and the fluttering of butterflies. As names like ‘Bee’s Friend’ and ‘Butterflyweed’ suggest, these six spectacular bloomers promise to attract pollinators to any garden. Blue Ribbon Tomato: Each Labor Day hundreds of tomato lovers gather at Heritage Farm (our picturesque headquarters in Northeast Iowa) to savor dozens of varieties of heirloom and open-pollinated tomatoes and vote for their favorites. This collection comprises the last six “blue ribbon” winners of this popular tasting contest. Seed Savers Exchange Favorites: They are the superstars, the crown jewels of our collection. This assortment of one colorful flower (zinnia) and five vigorous vegetables (heirloom kale, beans, chard, beet, and lettuce) is sure to thrill any gardener, novice or expert. Salad Garden: Your search for a delectable home-grown salad ends here. These five distinctive salad vegetables—‘Slobolt’ lettuce, ‘Bushy’ cucumber, ‘French Breakfast’ radish, ‘Dragon’ carrot, ‘Bloomsdale’ spinach, ‘Apollo’ arugula—boast superior flavor and texture. Container Garden: It’s true—almost anything can grow in a container, especially these six seeds. This winning combination of three flowers (‘Empress of India’ nasturtium, ‘Red Marietta’ marigold, ‘Irish Eyes’ sunflower) and three vegetables (‘Tom Thumb’ pea, ‘Paris Market’ carrot, and ‘Australian Yellowleaf’ lettuce) highlights varieties that deter pests, look great in tandem, and flourish in containers and small garden plots. Urban and Small-Space: Don’t let a lack of space dampen your gardening ambitions. These six seeds—‘Green Oakleaf” lettuce, ‘Purple Podded Pole’ bean, ‘Suyo Long’ cucumber, ‘Danvers’ carrot, ‘America’ spinach, and ‘Chioggia’ beet—will make the most out of every inch of any garden, no matter how big or how small. Beginner Gardener: These varieties are easy to plant and, better yet, quick to mature. This collection harnesses seven hardy and easy-to-grow heirloom varieties that don’t take long to become harvest-ready: ‘Black Beauty’ squash, ‘Early Fortune’ cucumber, ‘French Breakfast’ radish, ‘Green Arrow’ pea, ‘Provider’ bean, Seed Savers Exchange lettuce mixture, and ‘Velvet Queen’ sunflower. 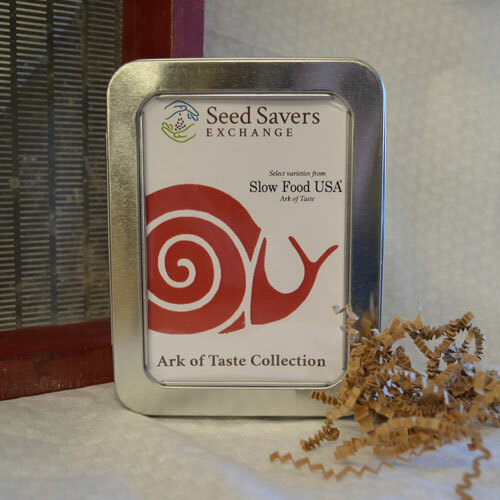 Ark of Taste: Slow Food USA places endangered foods in the “Ark of Taste,” then champions them so they stay in production and on our plates. Become a food champion as you grow these six vegetables (bean, beat, ground cherry, lettuce, pepper, and squash), savor their unique flavors, and discover their fascinating cultural histories. Children’s Seed: Four seeds, four delightful stories, and a companion instructional booklet to boot! Young gardeners will learn where food comes from and how plants grow as they sow easy-to-grow seeds for lettuce, beans, sunflowers, and popcorn. Seed Savers Exchange offers more than seeds to delight the gardeners and seed savers on your gift list. Browse all of our gifts and find the perfect one!